Are you a woman innovator? 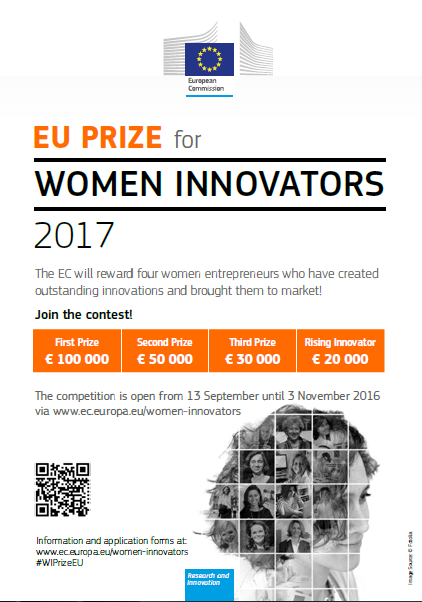 The EC will reward four women entrepreneurs who have created outstanding innovations and brought them to market! innovators aged 30 years or under can win the new prize for the Rising Innovator 2017! The European Commission has launched the fourth edition of the EU Prize for Women Innovators to give public recognition to remarkable women entrepreneurs who brought an innovation to market. Women represent only 30% of all entrepreneurs in Europe. With this prize, funded under the EU research and innovation funding programme of Horizon 2020, the EU seeks to showcase the achievements of women who overcome barriers to entrepreneurship, such as access to finances and networks, and draw attention to the need to increase female participation in the area. The contest is open to all women living in EU Member States or Associated countries, who have at some point in their careers received financial support from the public or private sector for Research and Innovation and who are founders or co-founders of successful running companies. Applications will be accepted until 3 November 2016.